Announce your wedding date with sophisticated floral save the dates that set a tone of elegance for your wedding. 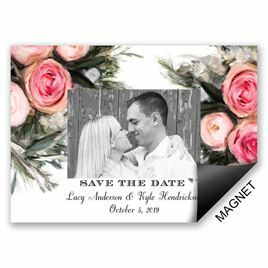 Shop the entire collection and enjoy a range of designs in all kinds of styles from photo save the dates to save the magnets and so much more. You can even find floral wedding invitations to coordinate with your save the dates and enhance your floral wedding theme. Let your wedding blossom into the special day you’ve always dreamed of with the perfect stationery right here at Invitations by Dawn.